No, the Poker Mutant hasn’t gone into hibernation, although with a trip to the doctor and the snow and the vagaries of the work schedule, I haven’t had as much time to devote to updating the blog as I’d promised myself I would. There’s a half-finished article in my bag on the mathematics behind teams of players entering tournaments that I need to get done. The day before my last post, I beat the rest of the field in my home league game, picking up some valuable points toward the Player of the Year prize of a WSOP buy-in. More importantly, since I’m still in second place and the season is drawing to an end, I knocked out KB—the current POY leader—before any of the other players, maximizing the value of the points I earned. Ten dry days went by before I made another hit, this time in the morning free roll at Portland Players Club. There were six of us at the final table, and one player had about a third of the chips in play when a deal was made to give her a big chunk of the prize pool and split the rest. Not a lot of money but some profit. I hadn’t played the Aces Players Club $5,000 guarantees on Fridays or Saturdays at noon before, but the results-oriented opinion is that I like them a lot. I was doing reasonably well by break two. The structure allows two re-buys, which can be purchased at any time in the first levels and stacked on top of each other, so it’s possible to enter the game with 30,000 in chips, akin to a Triple Barrel PLO game but where you have to pay for extra stacks. I just bought in once, but I was up to 38,100 at the second break, with the chip average several thousand lower than that. I caught an incredible break about 45 minutes into the fourth hour after raising with K♠Q♠ from middle position when a player in BB pushed all-in. I called and was heads-up against AxAx and practical elimination, but another ace on the turn made Broadway for me and I don’t think I’ve ever seen as disgusted a look on a player’s face. It pushed my up to 89,500 chips (total chips in play after the add-on was 1.78 million). I started knocking out players with things like A♠8♠ pairing the eight as the high card on an all-diamond flop. At the end of four hours there were only 30 of the original 70 or so entries and I was over 100,000 chips. Twelve places we’re scheduled to be paid. 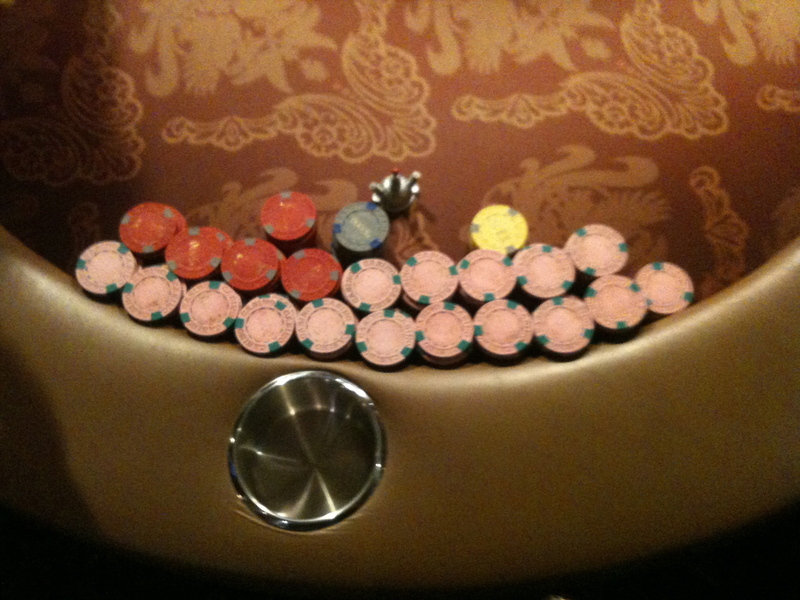 A huge knockout half an hour in pushed me over 200,000 chips, and another at the five-hour mark meant 260,000. By break three we were only four from the money (two, once a decision to pay two bubbles was agreed on). I lost a 60k chunk calling an all-in with A♠T♠ on a 6x8x4x flop when Ax8x made it, but then knocked out two players at once with TxTx (which had been working well for me all game). I called two all-ins, they had KxQx and KxJx and none of the cards on the board were above a jack. I was sitting on a stack of 430,000 chips, about 23% of the chips in the game with 10 players left. The final table bubble took a while to play out. After we consolidated, I lost a couple of calls for all-ins but made my way back both times until we were down to five players. 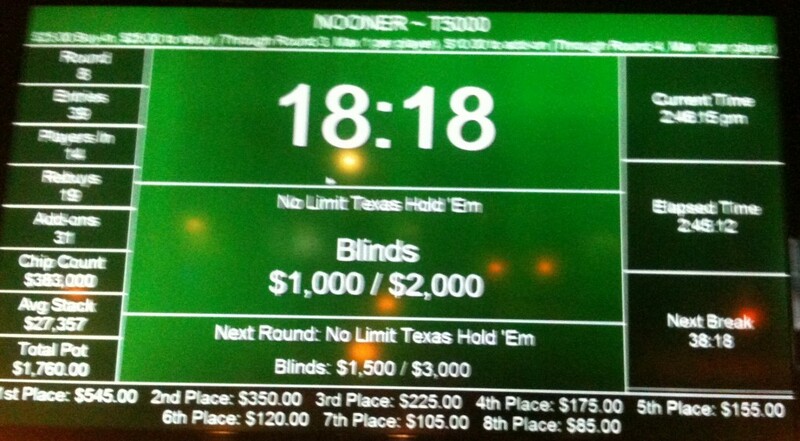 After doubling another player up for over 100,000, I still had the chip lead, but agreed to an even chop so I could get to the $10K at Encore. I think the stack below is about 600,000 chips. The full stacks are ten-high, the yellow are 25,000, the gray are 10,000, the red are 5,000 and the pink are 1,000. Over at Encore, I got into the game shortly before the end of the second level (I hate coming in late). I’d forgotten that the levels are longer and that I could have bought in for another hour, or I might have played out the Aces game to the end. Something to consider but I still hate coming in late. I got off to a good start right off the bat, pushing up over 16,000 in short order, then got cut down by N (who told me the other day he thought he played like a pro—although I thought at first he said “fool”—then again he spent part of another game one day trying to convince people I was Howard Lederer’s cousin) who rivered a flush against my paired AxKx. With 4,900 left, I managed to chip up a little bit until I hit two pair playing 8♣6♣ and N hit a straight with 7♦9♦ on the river. No re-buys! Finally sat down for lunch with MH, who I’d met at Aces originally last spring, passing around comparisons of the blind structure progressions of the big summer tournament series in Las Vegas. I hadn’t meant to play anything today, but since I’d won a game last night, his talk of playing the noon game at Aces was appealing. I was in BB right off the bat at table 1, but started going on a tear. A player MH had been telling me had an 85% cash rate was in seat 1 and I called a big raise from him pre-flop with 4♣6♣. The flop gave me four to a straight on the top, and a 5x on the turn gave me the bottom end. He’d tried to shake me off with a bet on the flop but I raised him all-in after I hit the straight and he folded with a bit of a speech about how I was a tight player (apparently, he doesn’t read the blog) and he didn’t think I’d have the six. I probably should have mucked it, but I showed my hand, then he mumbled something about how he was going to get my chips first. He got moved to another table not long after I took some more chips off him. I busted several players before the break with mostly less-than-stellar hands, except for QxQx where I called against two all-in stacks who both flipped over AxTx. My pair held and not long before the break I was over 27,000 chips. With about five minutes to go before the add-on, though, I picked up AxJx and got involved in a hand with two smaller all-ins, the smallest of which was QxQx and the (much) larger with AxKx. After the bloodbath was over, I was down to only 5,000. The second set of rounds did me remarkably well, however, and I chipped back up speedily. The guy from seat 1 got moved back to the same position, MH got stuck in-between us, and another player I knew well was seated on the far end. I survived a couple table consolidations, down past two tables, then got caught out with KxJx on a straight draw by a slightly larger stack calling my all-in. Two hours and forty-five minutes. -100% ROI. 15th of 39 players.